In the "Land of the Thousand Hills" nature is frugal and cattle is king. And, so, at one time, Rwanda was owned by shepherds and farmers. This nativity set was made in praise of shepherding. Tall and slim, the figures are people on the move, some carrying long staffs, one of them with the little shepherd's hut on his left shoulder. Proud nomads and marchers, these shepherds are never servile, and their respectful pose is a gesture of noble devotion. One posture, one attitude, this gesture of noble devotion is common to all of the figures, wisemen and Holy Family alike. Movement is suspended for a moment only, the time of the shepherds' feast. In no time they will be on the move again, carrying in their hearts the joy of a moment. 14 handcarved wood figures created by J.B. Sengayire in Rwanda. 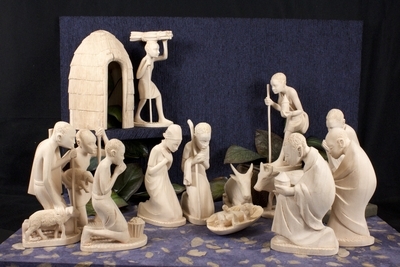 The figures depict Mary, Joseph, infant Jesus, shepherds, and animals. Exhibition label written by Father Johann G. Roten, S.M. originally for exhibition entitled "African Symphony" held at Roesch Library, University of Dayton.